The Exc!tement Movement (TEM) is all about exposing, teaching, demonstrating and enabling the paradigm and art of exc!tement-centered living. The ultimate drive behind all that: to keep moving towards humanity’s most brilliant future. Our vision is for TEM to become a global, co-created, and multilingual expansion of consciousness initiative. One in which an integrity-based exc!tement is at the core of how we all live, parent, educate, do business. And reinvent our economic, political and societal systems. But it all starts, here and now, with the individual. With you. That’s why TEM’s main role is to develop and expose content, stories, tools, training, and coaching programs, to help people accelerate, enhance and optimize their evolutionary path, lifestyle, and impact. All with an unique focus: the application of the exc!tement-centered paradigm. We see exc!tement in action everywhere: Arts. Sports. Entrepreneuring. Social Causes. Movements. Volunteerism. Open source developments. Inventions. Crowdfunding campaigns. Crowdsourcing projects. People exc!ted. Engaged with life’s adventure. People doing that which uniquely gives them joy. Some pushing the boundaries of what it means to be human. Inspiring change and driving humanity’s progress. Others, plainly being truly happy and fulfilled. But parallel to this display of human aliveness, we can still see the flip side all around. There are millions experiencing dissatisfaction with their lives, with their careers. Feeling empty. Sometimes depressed. In apathy. Disconnected. And beyond the individual, at the collective level, we are very aware of all sorts of social, political, economic, health and ecological problems. To move past those challenges, the need for new collective systems is becoming more and more evident. And it’s individuals driven by their exc!tement, the ones that will build the new systems destined to replace the obsolete ones. We need a common language to bring us closer. To allow us to co-create the next stages of our global cultural, economic, technological and political evolution. A language built-in in everyone, even though currently dormant for too many. We believe exc!tement to be that common language. And exc!tement-centered living its practice. Why is The Exc!tement Movement imperative? Experiencing and moving towards an integrity-based exc!tement-centered life, is quite a personal challenge. Now, imagine co-creating a civilization that promotes and supports that. That’s a cultural challenge of immense proportions. As a concept, reengineering our lives to revolve around the drive and guidance that true exc!tement provides, is fundamentally simple. But its practice is not easy. It’s definitively a journey of transformation and an adventure of self-realization, self-empowerment, and self-actualization. A way of living based on the guidance that exc!tement provides, from a space of self-empowerment and integrity. The E-C Paradigm is composed of 6 main philosophical concepts, 3 ethical principles, 2 primary questions, 3 core skills, and 6 spiritual dynamics. The art of exc!tement-centered living? Integrating those into how you live, learn, love and thrive. In your personal life, in your business, and ultimately, out into the world at large. Exposing the evolutionary power of true exc!tement and exc!tement-centered living. Build the largest global showcase of exc!tement-centered living, as an inspiring and powerful reference of how it’s working for people all over. Production of content, experiences and tools to inspire and guide how to start living the exc!tement-centered life. Create a thorough curriculum and franchisable training materials for teaching/learning the art and practical spirituality of exc!tement-centered living. Developing resources and a franchisable coaching system for ongoing support on how to live the serendipitous and unpredictable exc!tement-centered life. Adding a social component through web and mobile apps, to connect business and creative opportunities among people based on what is most exciting to each to create and provide. Creating the “World Exc!tement Report”. Enrolling influential ambassadors and spokespersons to introduce the exc!tement-centered living paradigm in educational, business and governmental systems, as to inspire change, evolution—and sometimes replacements—of those systems. Does this excite you!? 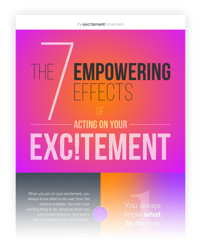 Become a TEM insider and get immediate access to «The 7 Empowering Effects of Acting on Your Exc!tement" infographic. Plus, get weekly insights on how to take your life, your vision, your business, and your impact to the next level. It’s all free ?